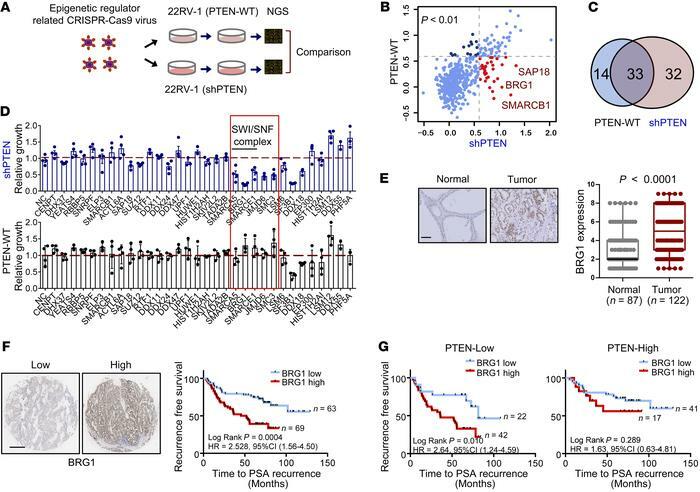 Identification of the epigenetic regulator required for PTEN-deficient PCa cells. (A) A schematic of the screening workflow for the chromatin regulator based on CRISPR-Cas9 screening in PTEN-WT and PTEN-KD (shPTEN) 22RV-1 cells. (B) Scatter plot showing the normalized counts for each sgRNA in the original pool (day 0) relative to the samples taken after 45 days of cultures (MaGeCK and MAGeCK-VISPR analysis). (C) Venn diagram showing the number of overlapping genes between the cells as indicated. (D) siRNA KD of 32 candidate genes and their effects on the growth of PTEN-WT and PTEN-KD 22RV-1 cells. Quantitative results shown are representative of 4 experiments. Genes highlighted in red box exhibited the differential growth effects between PTEN-WT and PTEN-KD 22RV-1 cells. (E) BRG1 staining indexes using a 10-point quantification scale in cohorts of normal prostate tissue (n = 87) and prostate tumors (n = 122) (Wilcoxon’s rank sum test). Scale bar: 50 μm. (F) Kaplan-Meier plot of recurrence after radical prostatectomy based on the BRG1 expression index in patients (P values by log-rank test). Scale bar: 200 μm. (G) Kaplan-Meier plots based on BRG1 expression in PTEN-low and PTEN-high tumors (log-rank test).